Do coral reef ecosystems mimic cityscapes? A captivating article by Madhusudhan Katti urges us to reimagine cities as terrestrial reefs that co-exist with other species, just as corals do. Human minds can imagine a different and symbiotic future where there is no competing and killing for space. This issue of Current Conservation is all about what we can learn from each other through imitation, adaptation and experimentation. Katie Shanks tells us about a fascinating research project that explores how biomimicry can be used to improve technology—whether the wing structure of a butterfly can be replicated to make more efficient solar panels. Mimicry is also often defined as an imitation that is trying to ridicule or mock. Aparajita Datta’s piece on large dams in Arunachal Pradesh brings out the deep crevasses in the regulatory and legal systems that make a mockery of legal procedures and safeguards. She brings attention to the critical issue of creating paper forests by destroying native forest, aided by the compensatory afforestation mechanism. Ritwick Dutta’s review of the National Wild Life Action Plan (NWAP) 2017-2031 talks about how the plan is in direct violation of the Supreme Court judgment when it does not mention the Asiatic Lion. No tweaks, says Dutta, but an overhaul will address the lacunae. 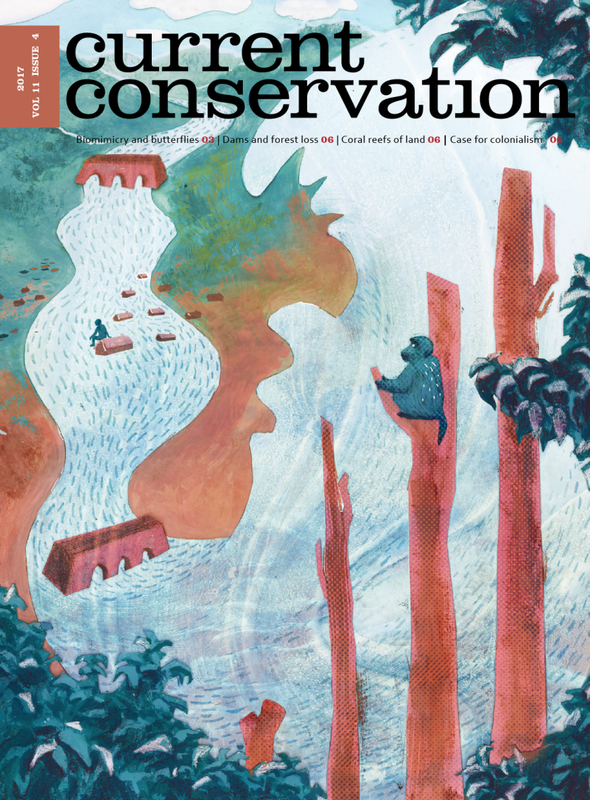 We do hope you find Current Conservation 11.4 an engaging issue and we welcome feedback and suggestions. We request you also engage with Dan Brockington “colonisation score-card” initiative to derive answers to whether countries need to be colonised and by what sort of power.